1. Eye Cream: I read once you can tell a woman's age by the state of her eyes, neck, and hands.Therefore, I put eye cream on all three. Twice a day. 2. Flood Lights: I'm post-traumatic from when I was robbed 17 months ago. So my yard is lit up like a baseball field. They're CFC bulbs which makes me feel a little bit better about the massive drain on the city's resources. 3. Deodorant: Believe it or not, there is "fun trivia" about this product. This includes that predators avoided early humans because the odor was too rank. Does "predator" include creepy men at Home Depot? Maybe I should rethink this essential. 4. Blinker: I'm obsessed with my blinker. I always use it. Even to turn out of my own driveway. I also reward and punish other drivers based on their blinker choices. 5. Punctuation Marks: I learned the importance of this handy tool when faced with the following string of words: "woman without her man is nothing." Choose wisely. 6. Curling Iron: I have a mother of a cowlick, which requires a daily does of 400 degree heat and hair spray with the word "freeze" in its byline. 7. Pop-up Post-its: Am I too lazy to hold the post-it pad while pulling a sheet away? Yep. 8. Sleep Timer: Experts say the blue tint from a television can actually keep you awake longer at night and alter your entire sleep cycle. I was clearly an outlier on those studies. 9. 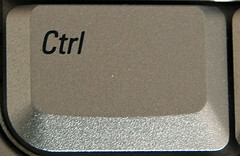 Ctrl-S: In many software programs, this lovely combination of clicks prompts a save. I have been burned too many times in the past to not make this a frequent part of my work day. 10. Drinking Straw: Even the rims of my own cups and glasses weird me out. Straws also help battle stainy teeth. However, the tradeoff seems to be more burping. Or at least I've been told. That is quite the carbon footprint you are leaving there. Forget the list of things you use everyday - it all starts with the list - must make lists. J: I balance it with no plastic bags and breathing in Carbon Monoxide released from my leaky stove. JM: Hi Mom. You are definitely my role model for lists. I have to have a radio. Never drive in FL. I am convinced that there is a major religion there that tells people not to use their blinkers. Ever. Scary. A: I bet he loves that. I find non-blinkers to not like to be judged.